Elias attended the local village school at first, then enrolled at the American preparatory school down the hill from Mieh-Mieh, The Gerard Institute. My grandfather earned enough from selling his farm products to pay the tuition, even though he didn't think my father really needed so much education. My grandparents wanted my father to work the farm, and indeed he continued to plow and to tend cattle throughout his childhood. At Gerard, Elias pursued his love of books, literature and the sciences as part of a rigorous American-style liberal arts education. He edited the high school literary magazine. He was the poor country boy in a school that attracted wealthy Palestinian boys and sons of rich merchants from Sidon. His classmates were Jews, Muslims and Christians of all stripes. One of his memories of high school was the Nakba, or "disaster" of '48, when his Palestinian friends who were boarding students suddenly became stateless refugees. He also remembered Jewish classmates who later emigrated to avoid the rising tensions in Lebanon after the establishment of Israel. Many of his ideals were formed at Gerard; we teased him in later years that he was actually an American Protestant, with the work ethic, the frugality, and the high-mindedness of a good Philadelphia Presbyterian. Gerard, unlike the French preparatory schools in Lebanon, demanded that its Arab students study Arabic along with the standard English language preparatory curriculum. Thus my father could take his love of poetry, learned at his father's knee, out of the oral culture of the village and into the larger world of literature. Whatever you want to say about colonialism (and he had a lot to say, most of it critical), the American school at Sidon did give him the gift of taking Arabic literature seriously. Another value he learned at Gerard (and later AUB) was that all people must be appreciated for their merits and achievements, not for their family background or religion. He was proud of his Arab heritage and his Lebanese identity; he appreciated his Melchite Catholic cultural inheritance. But he did not believe that these identities were superior to others. He reached out to people from every culture on the planet. He loved meeting new people, gabbing to them about his Lebanese identity, learning their languages, participating in their rituals, finding out about their history. He kept copies of the Koran and the Torah in his home, read them, and enjoyed discussing theology with rabbis, sheikhs and priests. The civil war of 1975-1990 pained him profoundly because he did not want to accept social or political divisions based on religion. After the war ended, when he and my mother lived in Beirut, he sought out friends among every sect in Lebanon. He even told me to stop speaking of West and East Beirut, for this implied a division he refused to accept. The polarization and hatred arising from 9/11, the Iraq war, and finally the assault upon Lebanon this summer disheartened him terribly. These traumas seemed to destroy everything he and my mother had worked for all of their lives. Back to Dad's history - he graduated from the American University of Beirut with a B.S. in engineering in the early 1950s; for several years he worked in Iraq, Yemen, and Somaliland, sending money home to his family, until he decided to get a graduate degree in the United States. Because he had little money, he chose Virginia Polytechnic Institute (VPI, or Virginia Tech) rather than MIT or Cal Tech, where he was accepted. It was during his first year at VPI that he took the International Students' party bus to a mixer at Randolph-Macon Women's College, where he met my mother. She was 19, he was 28. They bonded over Khalil Gibran. My mother's family are native Virginians since the early seventeenth century. They were uncertain about Elias at first, but they ended up welcoming him into the family. His marriage to my mother was devoted, passionate and extraordinarily close. Those shared values helped them negotiate their 47 years of partnership with joy. After getting a Ph.D. in engineering at VPI, Dad taught at a traditionally Black university in North Carolina for over twenty years (North Carolina A&T State University). His love of teaching and his determination to help others succeed made him a popular professor. I left out the part about my mother's civil rights work in college - he completely supported her when she got herself arrested for trying to integrate a lunch counter in Lynchburg, Va., in 1960. She went to jail for a month during her senior year, and he was 100% behind her. Teaching at a traditionally Black university in the South was Elias' way of solving the problems of racial injustice in this country. He identified with Black struggle, because of his own critique of colonialist subjugation of the Arab world. As part of my father's passion for ideals of the Arab awakening, he became a strong supporter of women's rights early on. He lived those ideals by urging his parents to educate his sisters; by educating his nieces; and by supporting my mother in accomplishing all her professional goals. When we were small, Dad took care of us and did housework so Mom could get a Ph.D. Once they became a two-Ph.D. household, he continued to take part in all aspects of our upbringing, including the laundry and cooking. He and Mom made their career and financial decisions jointly, cooperatively. In 1993, when she was appointed professor of Psychology at the American University of Beirut, he retired early from his teaching position in North Carolina to be with her in Lebanon. For the next eight years, he was the chief cook and househusband, devoting himself to my mother's comfort while she worked hard at the university. Let me remind my American readers that in the 1960s and 1970s, white American couples were breaking up over questions of who did the housework and whether the wife could have a real career outside the home. In our circles in North Carolina and Illinois, my parents' marriage was unusually egalitarian. They were ahead of the trend. We take certain things about women's rights for granted these days, but my father's support - emotional and material - was extraordinary for his time. Relatives on both sides of the family thought he was eccentric. Who ever heard of the Ph.D. professor father doing the family laundry, cooking supper, caring for the children? Elias was obsessed with helping foreign students get to the United States. I remember him handing out visa applications to college left and right during our travels; he helped many people from our village and the surrounding area get into American colleges, and in France one time he even tried to recruit our North African waiter to A&T. He also sponsored twenty-two relatives for American citizenship, and when his brothers arrived as refugees from the war, he and my mother mortgaged their house to help them start their businesses. Elias was the king of the second chance in life. Perhaps because he had left high school because of illness, then finished a year later, he always encouraged anyone who wanted to make a new start. He encouraged students who were struggling with their studies. More than one of us in the family flunked out of school, only to return at his urging and complete our degrees. Several cousins who turned their lives around have called me to say "he made me the man I am today." He encouraged women who wanted to go to college. 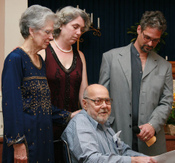 He encouraged families to support their offspring in higher education. Dozens of doctors, software engineers and IT specialists, some of them giving service in our military, achieved their professions because of my father's help. One cousin remarked "Africans, Pakistanis, Russians, he helped anybody who needed it, not just family." Regarding the tensions of the Middle East: nobody was more fierce in defense of the Arab cause than my father. But when I brought home a Jewish man to marry, my father opened his arms to my husband and his extended family, affirming often how much he cared about and respected them. Indeed, my husband's relatives are part of my father's social network here in California, and they have been a great comfort to us. Tabbouli was Elias' passport. He brought tabbouli to countless parties over the decades, and introduced my generation of American cousins to stuffed grape leaves, shish kebab, hummus and baba ghanoush. Fourth of July at our house meant barbecued chicken and tabbouli; at the end of his life, he said he had to beat lung cancer because he still had 25 tons of tabbouli to make. My father's love for poetry, along with his love for my mother and for his country, was his great passion. He achieved many admirable successes in his engineering and teaching career, but it was his poetry and his love for my mother that sustained him unto his last moments of consciousness. He wrote and recited so much poetry that he tried the patience of his children (we came around, of course). He read protest poems at anti-war rallies in the 1960s, 80s, 90s and 2000s. He wrote love poems continously. He liked to dash off verses in English and Arabic while sitting in the midst of a crowd of people, and he was always inscribing coffee cups, paper napkins and menus with his words. I wish that more of us could live the principles of tolerance and social justice that my father lived. I wish that Lebanon and the United States could become countries where people of all religions (or no religion) and all social backgrounds are free and empowered to live their best lives. Elias didn't survive to see peace and justice in the Middle East. I don't know if I will, either. But he practiced his values day to day, and if each one of you everywhere can do one thing to live your highest ideals, you will go far toward creating the kind of world we all want. 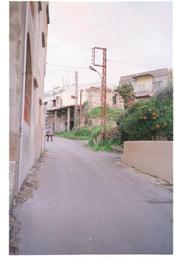 Photo is of the road next to the family home in Mieh-Mieh. The figure in the distance seems to be my father, walking up the hill into the heart of the village. Picture taken by Borre Ludvigsen in 1997 or 1998. Friday night before his death, at the musicale in his honor. Photo by Randy Bayne. Thank you, Leila, for this beautiful story of your father's life. You have honored him well. I got to know him and his town, family and friends, when I went to Lebanon a few years ago. He assisted me in contacting an elderly Palestinian historian who had been a student and colleague of my father's. Then he took me to visit him. Elias took on the role of brother and shepherd to me, arranging accomodations, showing me where to bank, shop, eat, and all the things you should know when visiting a strange place. I will always treasure the time I spent with him there, and am so thankful that I went when I did, in his kind company. I look forward to your continuing blogs. Thanks for doing this. That's a lovely tribute, more appropriate than what you could get a newspaper to print. Truly, this kind of heartfelt outpouring is the best use of blogs. I hope you'll post more of Elias' poems. So much about the Tabbouli King's life I never knew. It all gives me the oddest sense of hope. Thank you. Ron - well thank you. It's why I posted this particular story here, in this way. My father is complicated (as all humans are) so there are many other aspects to his story - I didn't include a sense of what a hambone, hilarious guy he was. He loved women, specifically my mother, he loved the pleasures of the flesh, he loved children and cavorted and told stories with his grandchildren and the children of all of his nieces and nephews. He loved to cook grape leaves and tabbouli etc. for crowds. He loved gardens, and he carved wood staffs by the dozen. Etc., etc. a fine family history and a noble biography. I am grateful for the few but memorable times I have spent with Elias, at his home and at Middle East peace meetings. Thanks for being a fine reporter of his wonderful life. I never knew yr father. I hardly know you except via blogging. And yet the reminiscence you've written is extraordinarily touching. It is so enriching to have parents who provide one with such a proud legacy. It gives you so much to live for and to give back to the rest of humanity. My father was in some ways like yours though he didn't live as rich & varied an existence as yours did. He gave me values to live by which I still try to honor though he's been dead for 11 yrs. Writing from Ramallah, Palestine, seems so far away. But I have a dear memory of your father. I had met your mother during a visit she paid to the Holy Land (so full of holes). She was contributing gracefully to efforts with The Rebuilding Alliance, for helping Palestinians rebuild their homes, destryed by the Israel's occupation army. I met your father in Southern California during a TRA event, and we stayed together at the house of the generous hosts of the event, Nabhan Simaan and his charming wife. We exchanged views and experiences, and I admired Elias' tolerance and his support for the Palestinian cause, in spite of bad things committed by some Palestinian fighters in Lebanon during the civil war. In reply to my question about identity between Lebanon and the USA, he recited to us a lovely poem he wrote about that, which I still circulate to people in the same dilemna. He talks passionately about his love and longing for the homeland, with all its shortcomings, and contrasts that with wanting to be with his grandchildren, and about the better roads and rule of law in the US. Special greetings to Mary with nice memories, and you must be lucky to have known Elias closely. Thank you for that lovely bio of your dad. We loved him--and your mother. The earth is a poorer place for his absence. Both of us are grateful that last spring we were able to have a lovely few hours with your parents in our home in High Point. We also were able to visit with them about a year ago in their home. Memories of those visits comfort us. We will send you a picture or 2. We met Mary and Elias in 2002, when they, fresh from Lebanon, attended a house party and Mary said yes, she would like to be the Outreach Director for what would eventually become The Rebuilding Alliance. Donna and Mary worked together for years, and Elias and Martin helped them keep a sense of perspective and humor. We all grew nearer in these past three months: Being part of the oasis of their home. Learning to make tabouli and stuffed grape leaves. Introducing Elias to mochi ice cream ("Mary Edith, you must buy me more of this!"). Making home-made stir fry noodles, fried rice, and brussels sprouts. Knowing about but setting aside the prolonged bombing of Lebanon and Israel. Recognizing Mary and Elias's commitment to fighting the cancer. Smoothing the rough edges of recalcitrant computer systems, bumps in the road to poetry. Holding hands and giving thanks for friendship. In a quiet moment, Elias told me how much he appreciated us, our decisions. By saying this, he gave us heart and made us brave ... a ripple effect that reaches beyond the moment and strengthens us. We miss you Elias and celebrate your spirit. Or whatever a belief one does dare. Turns the ocean of darkness into light. Seeking to speak and act as human. Nay, I will say to the warrior. Enough of your ways across the centuries. "Con Arvore" bear fruit and sway. I have no doubt that Leila's parents were very decent people like Leila herself. The enlightened people are trying to shed all prejudices. Leila is not there yet. Let us see an end of generalizations, and I will like her more. The less she listens to the propaganda of the misguided but also rather decent Silversteins, Weisses, the better person she will be. I was touched with your writings and what you wrote of your father. I feel so close to you and to every word of your article on your village and that area. Well I have spent the best years of my life there. We were living about 2 KM west of Gerarld, where I grew up among the green fields and orange groves...so I know very well Mieh Mieh and have lots of friends there.. I am now living and working in Abu Dhabi in an engineering consulting firm. Every time I read your writings and visit your web site, is like visiting our home there and the years of my youth. It’s so sad, but it’s surely heart filling. Farewell our sweet dove. Fly, fly, fly away.